Possibly, a generic term for plants with grey or silvery trunks, leaves, or general appearance. through PROTO POLYNESIAN *sina, "Grey; white haired ". Hinahina, Āhinahina (Argyroxiphium sandwicense, "Hinanina, Mauna Kea Silversword", Asteraceae; Artemesia australis and related species, Asteraceae). In both Hawaiian and Māori the word root Hina means "grey haired", and also refers to the personification of the moon, Hina (proto Polynesian *Sina); the derived form Māhina, a reflex of the Proto Polynesian word for "moon", *Māsina, still means moon or moonlight in Hawaiian, and also occurs with those meanings in traditional Māori poems, narratives and chants, but in modern Māori refers to dim light or early dawn. These are the plants of moonlight and early dawn -- the name definitely relates to their grey or silvery stems or leaves. Hinahina appears to be a plant name only in Hawai'i and Aotearoa, and this has given the compilers of the Pollex database reason to reconstruct a Proto Eastern Polynesian term *sinasina to account for the term common to the two languages. 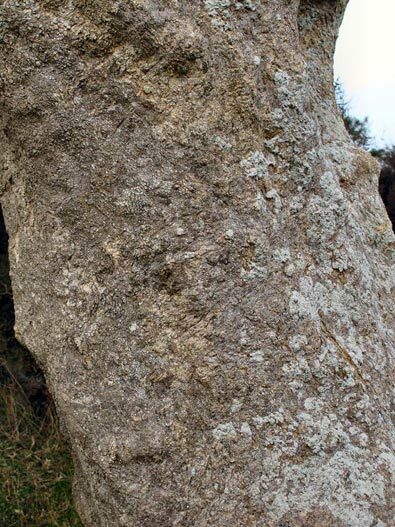 Pollex also lists the word as having a Moriori reflex with the same meaning as Māori hinahina (not further defined), but if that is correct, it does not refer to a plant, as the Māori "Hinahina as a plant" does not occur naturally on the Chathams, where the Moriori language was spoken. Apart from their being members of the plant kingdom, the only link between the Hawaiian hinahina (a number of diverse low-growing plants) and the Māori hinahina (a medium-sized tree), is the grey colour of their stems and/or leaves. That is quite enough however to explain how the new settlers in both regions could have made use of the same linguistic resources to coin the names for newly encountered vegetation -- a tree with a grey trunk and ghostly fallen leaves in the case of the Polynesian explorers on the East Coast of Aotearoa's North Island, and a number of plants with grey or silvery attributes in the case of those who explored Hawai'i's shores and mountains. The Māori hinahina is referred to by that name in the East Coast region of the North Island. Elsewhere it is known as māhoe, and is it described on the page devoted to that name (also uniquely shared with Hawaiian). There are illustrations on this page of its trunk and a fallen leaf, sufficient evidence to justify the tree's receiving the designation "hinahina"! The Hawaiian hinahina par excellence is the shrubby herb Heliotropum anomalum v. argenteum. This forms a key part of a coastal shrubland ecosystem and may well be the first of the Hinahina to have been encountered by Polynesian explorers and the first plant to receive this name. It forms prostrate mats on dunes and reefs and has soft, silky leaves and sweetly-scented flowers. In the dry coastal shrubland ecosystem it is associated with another coastal plant, the naupaka (Scaevola spp. ), bearing a name which Hawaiian and Māori have indubitably inherited from a common source. 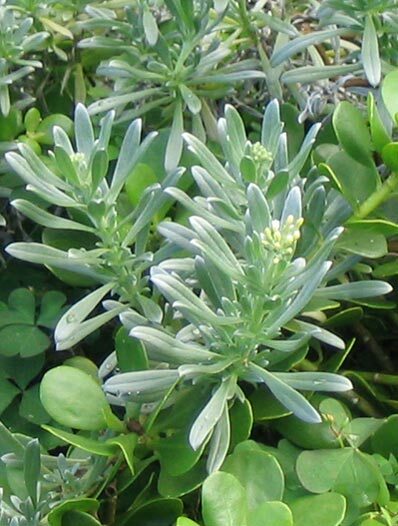 The green leaves of a naupaka can be seen complementing the silvery foliage of the hinahina in the photograph below. A very different Hinahina is the Mauna Kea silver sword, Argyroxiphium sandwicense, now a very rare plant which I was able to see and photograph in its natural habitat, thanks to my friend Gregory Trifonovitch who kindly drove me up the mountain, and the Hawai'i Department of Land and Natural Resources, which has taken steps to safeguard the remnant population of this and other endangered species of Hawai'i's native plants and animals. This hinahina is a member of the daisy family, Asteraceae (the Heliotrope belongs to the borage family). 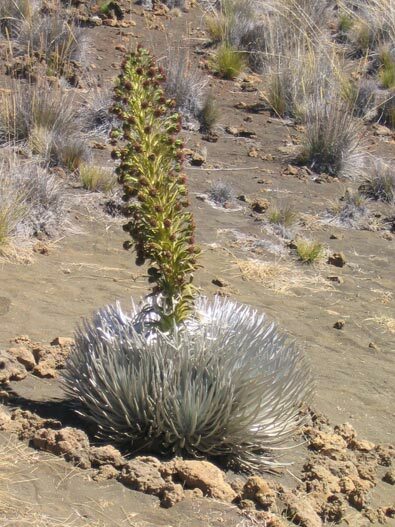 It is a small rosette shrub, usually single-stemmed, with silvery, sword-like leaves, confined to very high altitudes (around 8-10,000 feet above sea level) on the slopes of Mauna Kea, Hawai's highest mountain. Artemesia australis, a variable species of shrubby herb, is found naturally on windswept rocky slopes and cliff faces; it is the tomentose (hairy) greyish underside of the leaves (not at all evident in the photograph below, unfortunately) to which it owes its names hinahina and āhinahina. The whole plant is aromatic. It is found throughout Hawai'i. There are two other species of Artemesia which share these names: A. kauaiensis, confined to the island of Kauai -- this has greyish-green leaves and is not aromatic, and A. mauiensis, from the island of Maui, which is faintly aromatic and has finely-divided white leaves. These species are also members of the Asteraceae. Another group of Hawaiian hinahina are six species of Geranium (Geraniaceae), also known collectively as nohoanu. The one illustrated is G. multiflorum, is a multi-branched shrub growing 2 or 3 metres tall, with leaves that are greyish-green to silky grey on the undersides and reddish to dark grey branches, with the leaves clustered mainly at the tips. 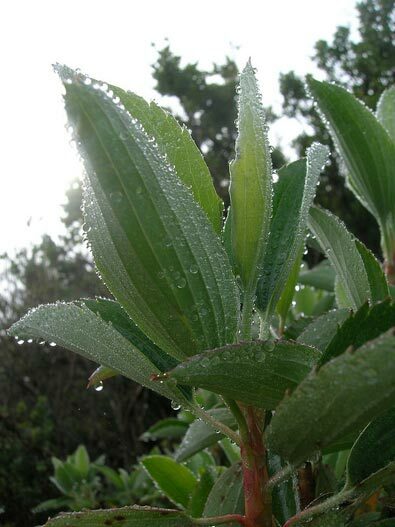 The leaves have a silvery-grey sheen in wet or foggy weather, as is well illustrated in the photograph below. It is found on the slopes of Haleakala volcano, East Maui, between 1,500 and 2,500 m above sea level. All of these species are denizens of the mountains, confined naturally to high altitudes (over 1,000 m). G. kauaiense is a sprawling plant found at high altitudes in mossy places on the island of Kauai (where it often roots at the nodes of the branches). G. cuneatum is a variable species with several local subspecies, found on volcanic slopes on Maui and the Big Island of Hawaii, where it grows up to a metre tall. 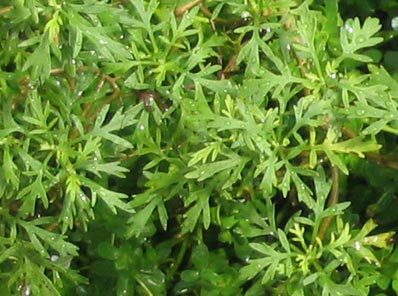 The leaves of Geranium cuneatum are sometimes densely grey on both surfaces, and it is one of the pioneer plants revegetating lava fields and exposed rocky places. The others are found in the wild only on the Island of Maui. They are Geranium humile, with leaves silky-grey on the undersides; G. hanaense, found in bogs in the Hana district of East Maui; and Geranium arboreum, which grows to about 4 metres tall and has green, hairy leaves, which, like those of G. multiflorum, would take on a silvery-grey appearance in fog or in sunlight after rain. The quality that all these plants have in common is their greyness or silvery sheen, te āhua hinahina, which unites the Hawaiian plants with their namesake in Aotearoa, whether or not a corresponding plant name existed in ancestral East Polynesia. Further information : There is information about all the Hawaiian plants in Wagner et al., Manual of the Flowering Plants of Hawaii, and most are mentioned in some of the other books on Hawaiian plants listed in the Bibliography. See the page for Māhoe for further information about Melicytus ramiflorus. 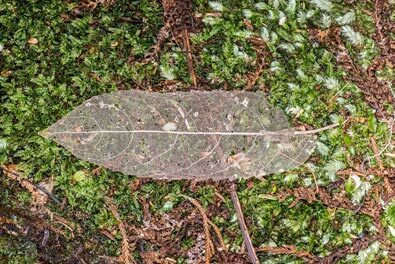 Photographs: Our grateful thanks to Kim and Forest Starr (Starr Environmental, Maui, Hawaii), and John Barkla and Jeremy Rolfe of the NZ Plant Conservation Network, for permission to use the photographs attributed to them. Other photographs are by R.B. (Te Māra Reo).